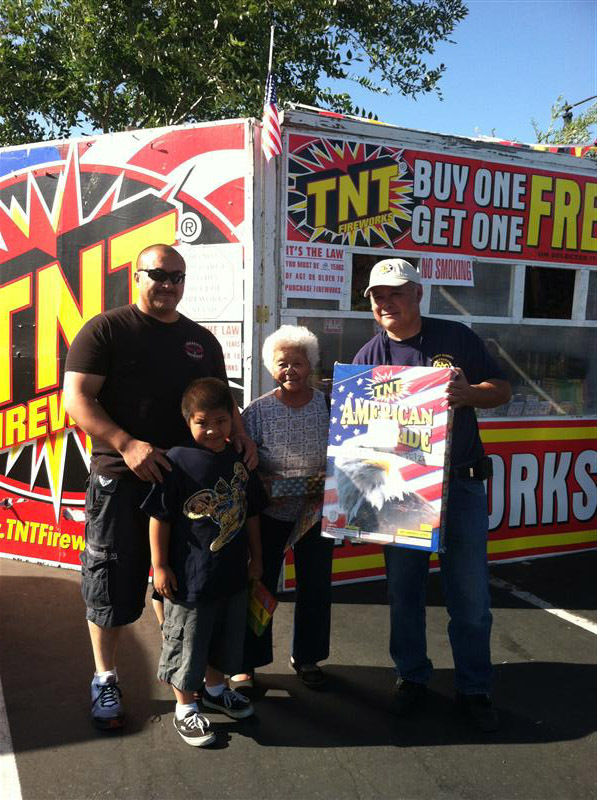 Above left: Joe and Peggy Gonzales purchasing the Big Bang fireworks with Rotarian Steve Dresser. Above right: Ernest Ka and his family with the American Pride and Rotarian Steve Dresser. Ed from the Texas Roadhouse and Ann Waller serve lunch to the participants. 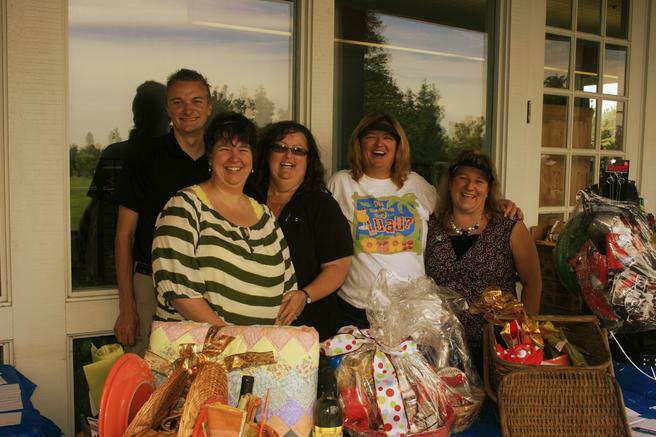 John Airrington, Beth Estante, Angie Smith, Pam Carson and Rotarian-Chair Cheryl Airrington at the registration table. 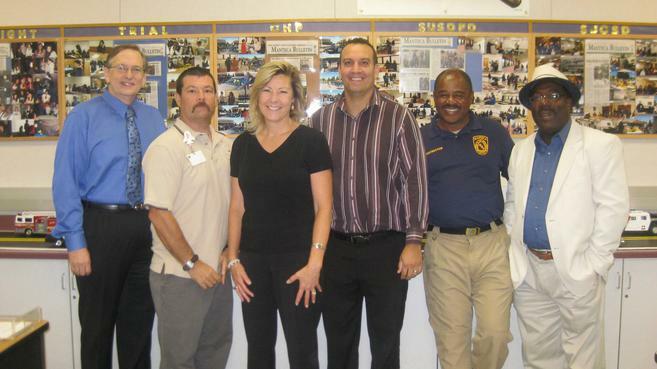 law enforcement and its related occupations. It was a busy but orchestrated scene at the Lathrop Senior Center as volunteers from the Lathrop Christian Center helped Rotarian Steve Dresser prepare the vegetables and turkey for his famous turkey soup. The soup has become a signature first entrée to the full-course Thanksgiving meal provided by the Lathrop Sunrise Rotary Club. As the pots of soup simmered, others were setting-up the tables, placing colorful cornucopia centerpieces on the tables, and the sounds of John Tesh’s movie themes played in the background. 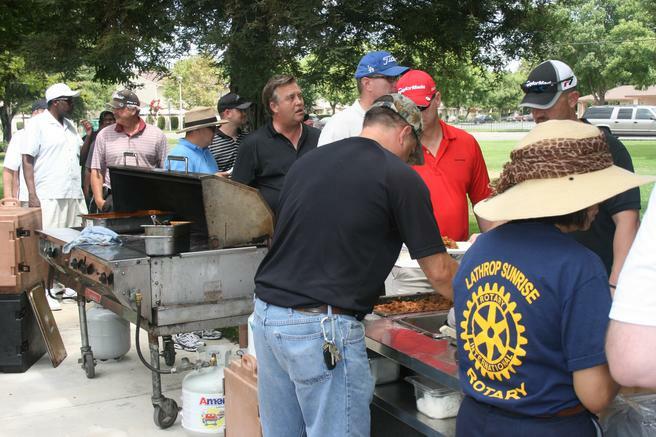 Meanwhile, at Sierra High School in Manteca, Rotarian Bob Gleason and his crew of volunteers were picking-up trays of baked turkeys and the rest of the main course to be served on this exclusively American holiday, Thanksgiving.